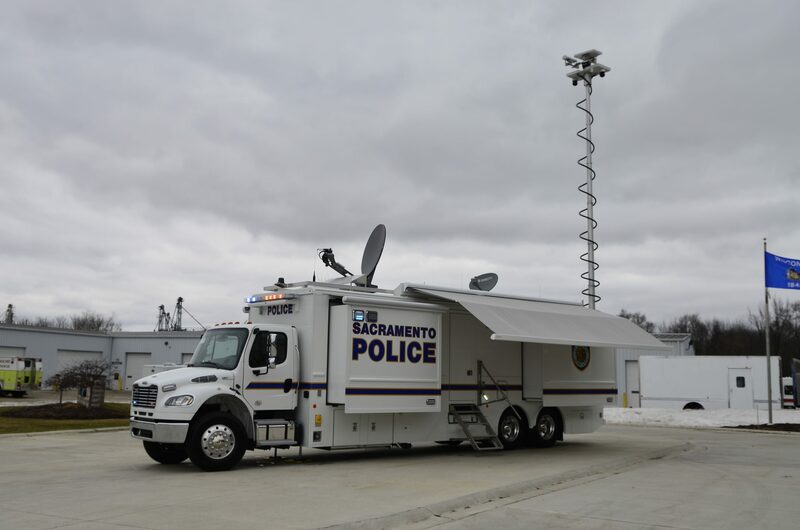 For their new mobile command center, the Sacramento Police Department chose a 40ft. Freightliner chassis with four flat-floor slide out rooms for maximum interior space. OUTSIDE The body is an all-aluminum construction with curb-side access. An integrated exterior workstation on the curb side was built with display monitor, network access jacks, telephone and more. On the street side, an on-board lavatory was included complete with toilet and sink. Access is via pull-out aluminum stairs on the outside of the vehicle. The vehicle also features a telescoping pneumatic mast with perimeter camera plus an additional four perimeter cameras around the body. On the roof, a communications satellite was installed along with a DirecTV satellite. Both a curb-side and street-side awnings were installed with accelerometers that auto-retract in the event of high winds. An aluminum raceway was fabricated and installed on the roof of the mobile command center as well. INSIDE In the driver/passenger cab area, a 3-camera system was installed with left, right and rear cameras, an Intel-I-Touch vehicle automation system, radio communications and emergency lighting & siren controls were integrated into the center console for convenience. Inside the mobile command center, a front area with four computer workstations and a center conference area that can be configured as either a low table or a high-top-style. A galley kitchen was included complete with refrigerator and microwave plus countertop space for a computer or other uses. In the rear, additional workstations plus a stowable conference table was designed to be a multi-use space.